I actually finished reading this book in May, but have taken my time updating this blog. This book is by the now-renowned posh bloke who first appeared on BBC's Castaway 2000 reality TV experiment on the remote Island of Taransay in Scotland. I am unsure what originally attracted my attention to this book as I didn't really hold anyone from that particular TV series in very high esteem. When I actually sat and read a small piece of the book in Heffers bookstore in Cambridge I was captivated not only by how well Fogle conveyed his story of journeying to these locations, but also the way in which he relayed his innermost thoughts about Islophilia - his addiction to islands. It came as a bit of a shock as the writer was known only really for getting upset on national TV when his dog got ill. 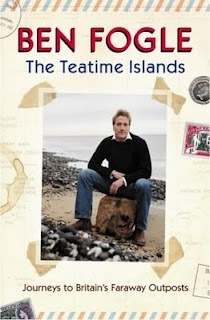 Ultimately the main thrust of the book is Fogle's attempts (mostly successful) in discovering for himself some of the remaining outposts of the British Empire. Included are Tristan da Cunha, St Helena, The Falklands, The Pitcairns, British Indian Ocean Territory and another that escapes me. There is the slight sense of elegy, mainly for the once mighty British Empire, detectable in Fogle's narrative. Reassuringly there is also the comfort found in the thought that the sun still never sets upon the Empire. A worthy read from the most unlikely of sources.